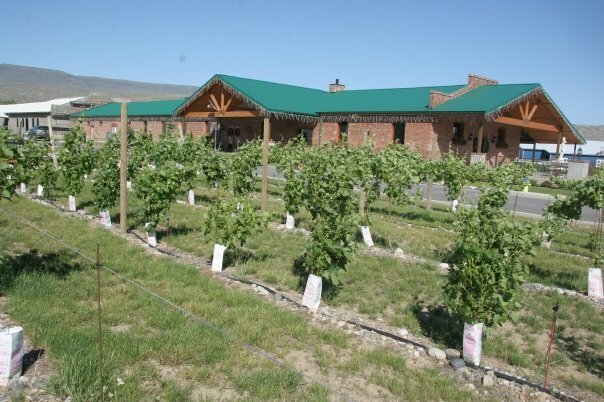 Chateau Faire Le Pont Winery is a state-of-the-art winery located in the beautiful Wenatchee Valley. We are situated at the north end of town, near Confluence State Park, where there are 11 miles of paved bike & running trail (known as the Loop) that run on both sides of the Columbia River, across both north and south bridges. Bursting with more than 300 days of sunshine a year, majestic mountains, beautiful rivers and lakes, the Wenatchee Valley is a recreational year-round paradise. Our beautifully renovated 1920’s brick warehouse was formerly used for staging fruit to be loaded onto trains. We have created an elegant, multi-use space while maintaining the strength and character consistent with a historic old brick warehouse. The expansive windows frame a panoramic view of the mountains. Each individual brick inside was “hand-painted”, restoring the original look. A large two-sided rock fireplace divides the center of the winery, with an intimate seating area on one side and the large multi-purpose activities room on the other. The original hard-wood floors separate the winery, restaurant, tasting bar, and activities room, from the cellar which is home to all of our wine aged in Mostly French oak barrels, along with our very special wine library and private intimate dining area. Winemaker’s dinners and other very special occasions are perfect in this unique and special setting downstairs in the cellar among the barrels. We produce world class, ultra-premium wines from locally grown grapes. Production levels are between 3,500 to 5,000 cases of wine per year. Our grapes come from the nearby Yakima Valley, Alderdale and Mattawa, where we work hand-in-hand with premium growers to insure we get only the very best grapes. We source by site and row. All fruit is hand picked and sorted. We use the gentlest possible process to ensure maximum extraction in the production of our wines. Contact our professional and experienced Events Coordinator here at Chateau Faire Le Pont Winery to learn more. Call us or email us and we would be happy to set up an appointment, so that we can cover all the details as well as provide you with a tour of our facility. We promise to be attentive to your every need in order to make your special event a success in every way.